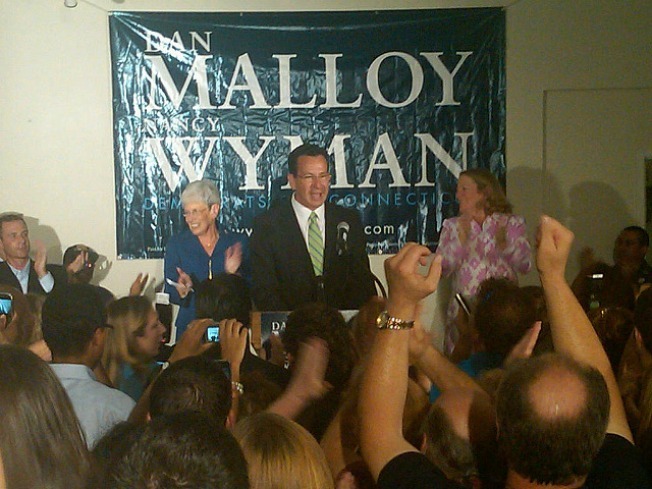 Dan Malloy addresses supporters in his victory speech in Hartford Aug. 10, 2010. Gov.-Elect Dan Malloy has chosen the leaders of his policy working groups to begin to determine how his administration will move forward while facing a nearly $3.5 billion budget gap. These groups are still being formed will work with Policy Transition Team co-chairs Linda Kelly and Joe McGee to gather information on their given policy areas, he said. The committee is responsible for formulating and proposing ideas that require no new spending. They are also encouraged to suggest ideas that would cut state spending. "We have a gigantic challenge before us -- how to balance a budget, learn how to live within our means and to begin the process of growing our economy," Malloy said. Municipal leaders are curious about how they will be affected and Malloy said he does not want to “further damage the relationship with local government and state government." Malloy said he won't balance the budget by slashing human services, especially as more people depend on them, but he also doesn’t want to put the state at a competitive disadvantage to grow business and jobs. Malloy said he will not raise taxes to pay for any new services, so he is asking his policy teams to find ways to fund any programs they wish to add. Jamey Bell. Another co-chair will be announced.